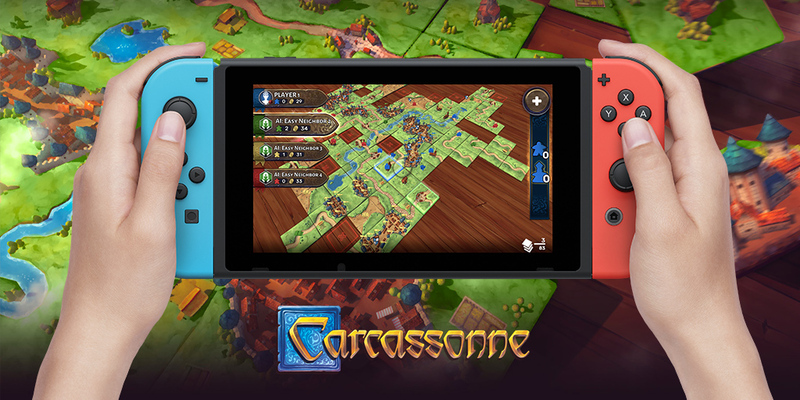 PARIS – Dec. 6, 2018 – Asmodee Digital today announced the release of Carcassonne for Nintendo Switch™, the first of several digital board game titles being optimized for the platform over the coming year. Carcassonne is available on the Nintendo eShop now for $19.99 MSRP. Carcassonne is mainstream: simple to pick up, but challenging to master, presenting players with endless opportunities for tactical play. Nintendo Switch offers a complementary experience: players can enjoy the digital advantages of tabletop at home – no set-up or scorekeeping required – and take their game on the go with portable handheld capabilities. Asmodee Digital, a fully owned subsidiary of the Asmodee Group, is an international publisher and distributor of digital board games with operations located in Europe, North America, and China. Asmodee Digital manages the creation, design, development, publishing, and marketing of board and card games on leading digital platforms – spanning mobile, PC, Mac, virtual reality and consoles – for Asmodee studios as well as for third-party publishers. The current Asmodee Digital catalog includes best-selling digital games such as Catan VR, Carcassonne, Ticket to Ride, Splendor, Agricola, Mille Bornes, Pandemic, Small World 2, Mr. Jack London, Colt Express, Mysterium, Potion Explosion, Onirim, Jaipur, Spot It! Duel, Abalone, Ticket to Ride First Journey, Catan Stories, Talisman, Fighting Fantasy Legends, Smash Up and digital versions of many other well-known board games.